Features classic characters from 50 years of Doctor Who, including the series’ greatest monsters, all 11 Doctors and the most important Daleks and Cybermen from every era! Every issue comes with a richly illustrated collector’s guide that provides all the essential information about your figurine and is filled with official photography supplied by the studio. 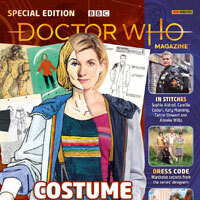 The per issue price is as follows: UK price is £2.99 for issue 1 and £6.99 for issue 2 onwards. 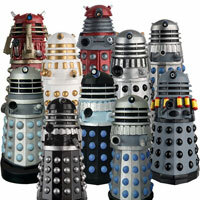 A premium subscription upgrade is available which gives you additional Dalek Models. 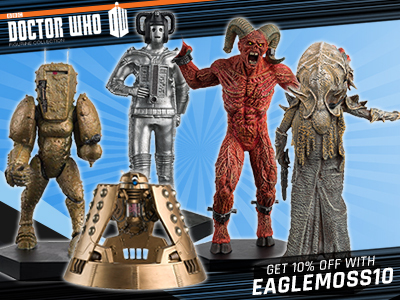 As a subscriber, for £1 extra per issue you have the exclusive opportunity to upgrade your subscription and receive these seven limited-edition Dalek figurines and a specially designed display base, supplied in eight shipments over the life of the collection. 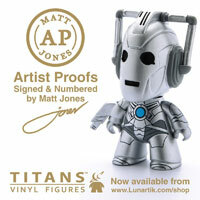 Each highly detailed, metallic resin model is an individually numbered, limited edition figurine that won’t be available to non-subscribers. The specially crafted display stand has been designed exclusively for the seven Dalek Figurines and is only available through this premium subscription offer. I saw these yesterday. We knew what they were anyway thanks to Neil Corey. But my didn’t they go so terribly wrong with the Fifth Doctor’s face. 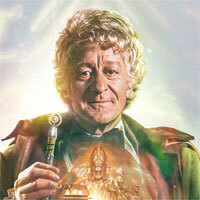 The Doctor looks good with his hands in his pockets, so keep ’em coming. 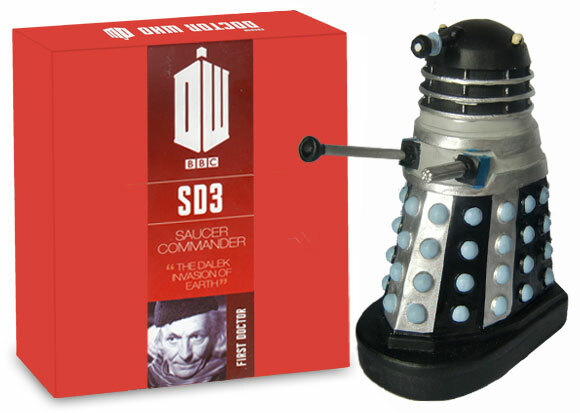 Will there ever be a mini-binder for the special Dalek issues? They’re so small, they keep slipping away. I haven’t signed up for binders. Once the free one was full, I just bought a cheap pocket folder and put stickers on it. 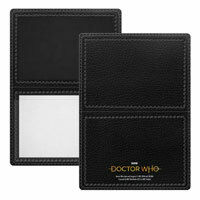 I use one pocket for the Dalek mags, one for the large TARDIS mag and then each months mags in a separate pocket. It is cheaper, less fiddly and easier to access the magazines than the standard binder. My freind has got this. I got this today, I think it’s a really good figurine and the mini magazine with it is good too. 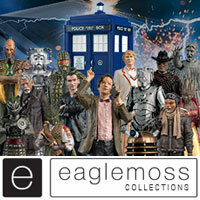 Eaglemoss forgot to send me my “Rare Dalek 3”. I received magazine part 30, 31 and Rare Dalek 3 booklet, Sea Devil and Kahler Tek but no Rare Dalek 3. Is that normal? It’s not normal, but other people gave had similar with past issues, not with this one though, just email/phone/facebook Eaglemoss and they will send you one, you’ll probably get another ‘booklet’ too. Finally received the Dalek, the paint job is horrible like it is painted by a primary school child!!!! I think I will complain as mine looked like it had been painted by is child. I think EM has a quality issue here. Eaglemoss are realising ‘Harry Potter’ Figurines from next year. But they already get enough money from me with one collection! Same for me. Oh, well. It’s worth it. Let me know when they start releasing Gerry Anderson stuff !! Was mine the only one with perfect paintwork? All three were awesome, but I got a letter saying my plinth had been delayed. No reason. Also, was anyone else surprised at how much green was on the Sea Devil? On mine, the only brown bit was the face, even the fins on the head were green. The paint on mine was perfect, although I’m not all that happy with the paint used. It’s overly shiny and incredibly thick which detracts from the figure really. The quality of the Saucer Command Dalek I received was really crap, smeary paintwork on the silver bands, smudged hemispheres, dome had basepaint showing through, very substandard. I’m surprised Eaglemoss allowed it to be released. Just finished redoing the paint on my Saucer Dalek. Not perfect but it’s much better now. Got mine today and the Dalek is fine no complaints at all. Received the new issues today. 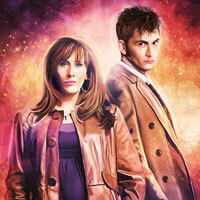 The Sea Devil and the Gunslinger are brilliant. The Dalek is atrocious. Its almost insulting to receive something so bad especially when we are paying extra for these Daleks! I’ve just got my one and it’s terrible. The paint is unbelievably bad and the disc on the back isn’t cast properly. Really bad work. I wish I could post a picture so you could compare it to the pics from Eaglemoss. The figure you get is nothing like the figure they advertise. The Daleks seem to be particularly bad figurines, mine is much the same with poor paintwork. I suspect Eaglemoss will be getting a lot of complaints, considering we pay extra for “special” Daleks that only seem special for being poorly painted. most of the monsters recently have been great, no complaints there. They didn’t really advertise this one at all though Derek Dalek, unless you count the little CGI Dalek on the site and fliers. There does seem to be a problem with all of the 60s Daleks, I’m beginning to wonder if they are painted by different people to the others or whether they just don’t put as much effort into figures that they assume people will like anyway and more time into the less interesting characters. Well, that was longer comment than I had intended. 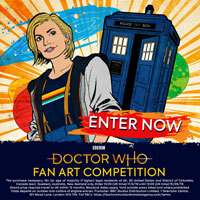 When I referred to the ‘one advertised’, I actually meant picture above (Sorry, didn’t make myself clear). It is a shame, a big reason for me subscribing to this collection were the Dalek figures(both the specials and the regular releases), and as others have said they seem to be the worst painted of the lot. In general the paint quality has improved a lot over the last few months, which makes this figure look even worse! The other two figures I received at the same time were pretty good. The figurine on this page isn’t as advertised, it’s just the Dalek that booboo got. Some people on facebook (a very small no. of people) do actually have one as good as this, booboo was one of the lucky ones. My Dalek, like yours, was not so well endowed and I agree it’s a shame. But I repainted mine so it now looks maybe slightly better than this one. just don’t blame eaglemoss for advertising this one when they were careful not to. This is in fact proof that some of the figures actually did come out good. I didn’t realise that, my mistake (sorry!). I won’t blame Eaglemoss for their advertising then, but I do blame them for the lack of quality control on their product. You shouldn’t have to be ‘one of the lucky ones’ to get a decent model. I have contacted them and they are supposed to be sending out a replacement, which is good news. I just hope the one I get isn’t the same (or worse) that the one I currently have. I agree, and I hope your second Dalek is better. When do we get the Stand for the Daleks ? What’s with the blue paint on the gunbox? Looks like a fantastic sculpt, just the paint seems a bit off. 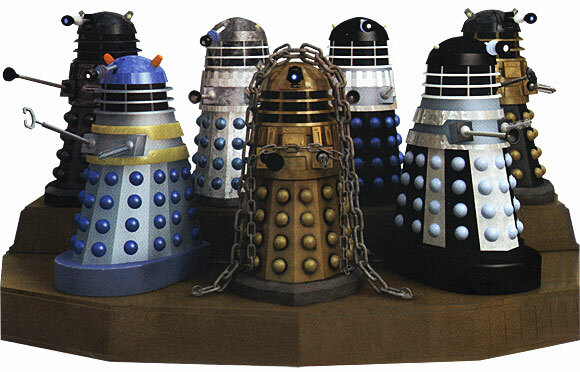 They seem to copying the blue theme from the Master Plan Dalek, I wonder if blue is their favourite colour? 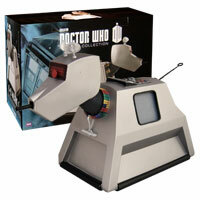 What were the other two special daleks released so far? 28 and 29 are still missing. Did you not get yours booboo? It’s a great Dalek this. Received mine today-absolutely awful paint job- looks like a 3 year old painted it.Phoned for a replacement,on hold for 15 minutes and the person said it’s the worse dalek they’ve had so far. I mean a great Dalek, I know the painting is awful.